Posted December 3rd, 2018 at 1:28 PM (CST) by Jim Sinclair & filed under In The News. – Fed Begins to Waffle on Interest Rates and Tightening? Watch the Dollar and Gold! As I was shuffling papers in some old files, I came across a slip of paper on which I had written down the price I had paid for a Mexican $50 gold peso coin: $717 Mexican pesos. Judging from the price, I figure that the purchase was made sometime in 1972, when the price of a Troy ounce of gold was $46 dollars. The Mexican $50 gold peso coin contains 37.5 grams of pure gold, and 37.5/31.1 grams per Troy ounce, is 1.206: so there is 1.206 times more gold in a Mexican $50 gold peso piece, that in a Troy ounce of gold. Thus, $46 dollars per ounce x 1.206 = $55.48 dollars as the value of the gold in the $50 gold peso coin, in 1972. The rate of exchange Dollar/Peso in 1972 was $12.50 Mexican pesos per dollar, so $55.48 US x $12.50 = $693.50 pesos. I paid $717 pesos, because gold coins are always sold for a small percentage more than the price of bullion gold; in this case, the surcharge was for 3.4%. The international price of an ounce of gold, as of last Friday, November 30, closed at $1,222.10 dollars. The rate of exchange was at $20.40 Mexican pesos per dollar. So today’s price of the Mexican $50 gold peso coin should be close to $1,222.10 x $20.40 x 1.206 = $30,067 pesos. The quote this morning is: $30,890 pesos. They’ve just come up with this idea? Clif High predicted next winter to be the worst in the USA and Canada in one hundred years. The planet is getting hotter by the day? Ever heard of Chem-TRAILS? Just look up and see them today. This is not a contrail. Earth keeps getting hotter. Humanity isn’t doing enough to stop it. So, scientists are increasingly musing about conducting dramatic interventions in the atmosphere to cool the planet. And new research suggests that a project of atmospheric cooling would not only be doable, but also cheap enough that a single, determined country could pull it off. That cooling wouldn’t reverse climate change. The greenhouse gases would still be there. The planet would keep warming overall, but that warming would significantly, measurably slow down. Those are the conclusions of a paper published Nov. 23 in the journal Environmental Research Letters by a pair of researchers from Harvard and Yale universities. It’s the deepest and most current study yet of “stratospheric aerosol injection” (also known as “solar dimming” or “solar engineering”). That’s the spraying of chemicals into the atmosphere to reflect the sun’s heat back into space, mimicking the global cooling effects of large volcanic eruptions. The researchers found that humanity could, using this method, cut our species’ annual contributions to the greenhouse effect in half at a price that states and large cities spend all the time on highways, subways and other infrastructure projects: a total of about $3.5 billion over the course of the next 15 years to develop the technology. (Most of those funds would go into building planes able to carry big tanks of aerosol spray into the stratosphere, about double the cruising altitude of a Boeing 747.) Once the tech is ready, the researchers found, the project would then cost another $2.25 billion or so each following year (assuming the effort would run for the next 15 years). 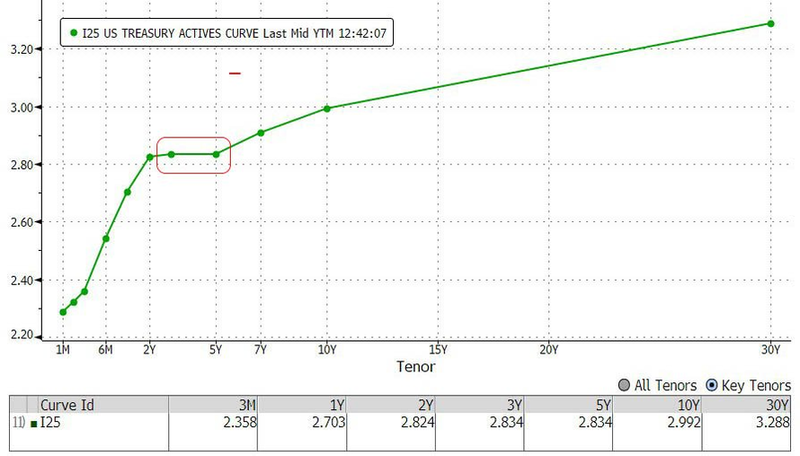 We have talked about, written, and warned about the yield curve inverting. It is happening again, only this time with a global credit bubble firmly in place. I would ask “what could possibly go wrong” but in light of the current credit structure…the better question is what won’t go wrong?!!! Page queried in 0.608 seconds.